Joni Blecher is a freelance writer who has spent her career covering tech and a myriad of lifestyle topics. When she's not writing, you can find her exploring the food scene in Portland, Oregon. The microscope is one of the quintessential symbols of science, invoking images of researchers in white lab coats looking for the next big breakthrough. As a kid, you may remember using one to get your first glimpse of paramecium in pond water or to view the cell structure of an onion. Microscopes have been saving lives for decades by helping diagnose any number of deadly diseases, but in many parts of the world, they are in short supply. That's about to change. Technology is transforming smartphones, iPads and even paper into durable, ultra-portable microscopes that only cost a few dollars to make. 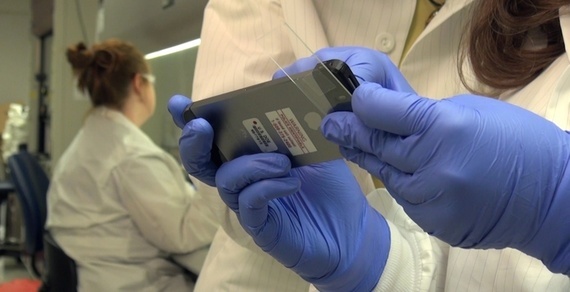 Scientists at the U.S. Department of Energy's Pacific Northwest National Laboratory created a small device that clips onto a smartphone or tablet, turning the camera lens into a microscope. They used a 3D printer to create the attachment, which holds an inexpensive glass bead that provides the magnification. Once attached, you can hold a standard glass slide and with the specimen you want to magnify up to the bead and view on screen. There are three lens designs: 100X magnification for viewing salt crystals or the structure of a leaf, a 350X version that can identify parasites in blood (malaria) or protozoa in drinking water (cryptosporidium), and 1000X option that can identify anthrax spores. The blueprint for the attachment is available online, so if you have access to a 3D printer and about a dollar's worth of materials, you can make your own. Dr. Steve Lee, a scientist at Australian National University, has found a way to literally bake microscope lenses in an oven and attach them to smartphones. Think Shrinky Dinks, but using the same material found in contact lenses. 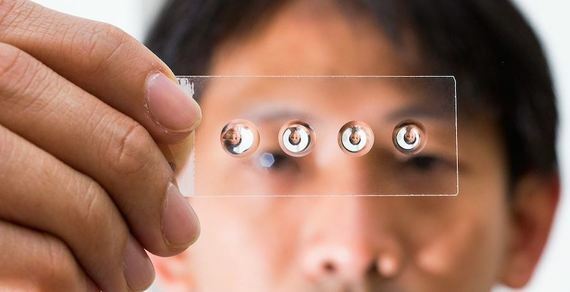 To create the lenses, Lee places a drop of gel-like silicone polymer called polydimethylsiloxane (PDMS) on a glass slide and bakes it at 158 degrees Fahrenheit until it's hardened. Lee places another drop of PDMS on the base. The slide is flipped over and baked again, using gravity to form a droplet. More drops can be applied to create the optimum lens shape. When finished, the lens slides into a small frame made by a 3D printer that fits over a smartphone's camera lens. Though not very powerful (only about 160X), it can be used as a skin-examining dermascope to help diagnose diseases like melanoma. This tiny lens costs just a few bucks to create. If a 3D printer and smartphone are out of reach, there's a low-tech option that you can assemble from a piece of paper for less than a dollar. Developed by a research team at PrakashLab at Stanford University, Foldscope is an origami-inspired optical microscope that can provide over 2000X magnification. It comes on a piece of paper, and you simply remove the parts and start folding. There are no written directions, so the design is pretty intuitive. Once assembled, you can use it to view common bacteria and parasites with standard glass slides. 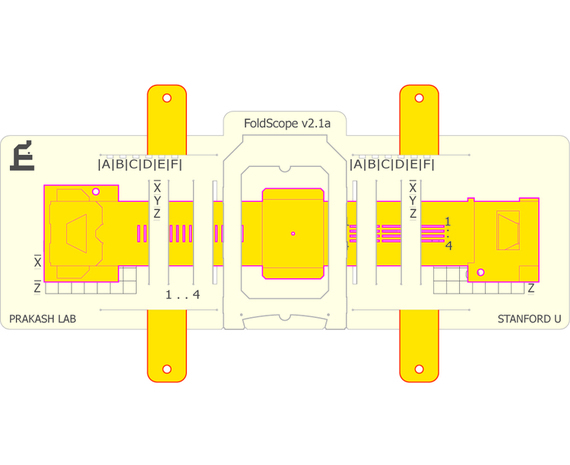 All that's needed to make a Foldscope is a sheet of polypropylene paper with the microscope design, a 140X low-mag lens or 2,180X high-mag lens (depending on the application), a 3V button battery, a white LED, an electrical slider, and copper tape. 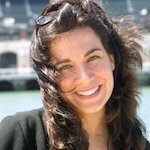 Foldscope's creators say their mission is twofold: to impact science education by enabling the dream that "every kid in the world should carry around a microscope," and to impact global health by developing disease specific instruments that are designed for diagnostics, are extremely robust and extremely easy to use by health workers. The product is currently in beta testing with 10,000 users. To see images and read beta tester's stories, check out the project's blog, Microcosmos. Visit XPRIZE at xprize.org, follow us on Facebook, Twitter and Google+, and get our Newsletter to stay informed.